The sleek "Revo 11" is lightning fast off the line, a MirageDrive powered pocket rocket that"ll turn in its own length. Performance in a tidy 11-ft. package, easy to transport and store. The Oasis is stretched-out and spacious, the more performance-oriented of Hobie"s pair of tandems powered by the elegant, easy-to-use MirageDrive. 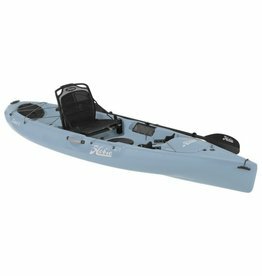 Hobie"s original Pro Angler packs extreme fishing utility, with scads of (that"s six) horizontal rod lockers, enough tackle compartments to empty a store, and an elevated Vantage ST seat that"s as much easy chair as captain"s perch. The Hobie Lanai glides smoothly and efficiently, despite its compact size. Sleek. The Hobie Mirage Revolution 16 boasts a long, lean hull that"s low on drag and big on speed, allowing you to glide along at a pace typically reserved for far more fragile kayaks. Dominate the water, fresh or salt. The Pro Angler 12 deploys all the big-boat fishing features of the "PA" series on a 12-ft. long platform that fits neatly in the back of most any pickup truck.